An academic consideration of the cultural meanings behind increasing surveillance and post–9/11 securitization. Lewis (American Studies/Univ. of Texas; Navajo Talking Picture: Cinema on Native Ground, 2012, etc.) 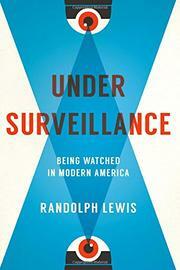 sets out “to ask difficult questions about the weirdness and weariness of living under the blanket of surveillance technology.” He is clearly fascinated by its pervasiveness, and he argues that the traditional suspicion of surveillance ought to be reconsidered, that “the sustained and subtle impact of surveillance” adds richness of experience and even “fun” to our lives. Lewis explores these concepts in six long chapters, wide-ranging in topicality, from the overall expansion of CCTV networks to the resonance of Thoreau’s ideas within today’s surveillance state. He first establishes the emotional effect of overlapping types of surveillance, now integrated into our lives in venues ranging from nanny-cams to documented police shootings. “Surveillance conducted by citizens, or sousveillance, is supposed to shield us from the worst abuses of the state,” he writes. In the aptly named “Welcome to the Funopticon,” Lewis discusses the classic surveillance literature of George Orwell and Jeremy Bentham alongside his thesis that the provocative, public nature of surveillance is enriching us, noting, “what has not been fully understood is how much pleasure is driving this expansion of surveillance into our daily lives.” Elsewhere, the author contrasts the solemnity of the 9/11 memorial with the frenetic civic paranoia the attack unloosed, exemplified by the phenomenon of “sacred security” companies. These organizations fortify conservative evangelical Christian churches against doomsday scenarios, and they are experiencing rapid growth, like all connected with the surveillance industry. Lewis can write perceptively and with power, as in an autobiographical section reflecting on the social surveillance of his hardscrabble 1970s suburban childhood, but he also falls back on a synthesis of scholarly reading and theory that may not fully engage lay readers, in terms of current controversies and real-world relevance. Will appeal to sociologists and students of cultural studies and behaviors.